Our line of polypropylene strapping kits gives you a convenient choice of strapping equipment to suit a wide range of packaging applications. 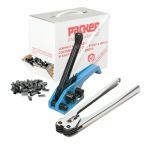 We have lightweight hand strapping starter packs with plastic buckles or metal seals, and an impressive complete starter strapping kit with an additional tensioner and sealer as well as the seals. 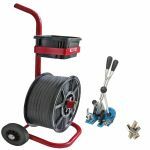 For more frequent strapping we have medium duty strapping kits with an additional dispenser or trolley, and a combination medium duty strapping kit with trolley and combination strapping tool. Whichever you select, you are guaranteed to have a plastic strapping kit that’s portable and easy to use. Whether you need lightweight or medium duty polypropylene strapping, pick a strapping kit that fits your requirements perfectly. 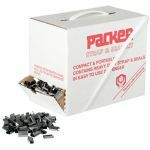 Beginners or occasional users need not worry getting started with packaging or pallet strapping, thanks to our range of poly strapping starter kits. Designed to give you strapping comfort and convenience, these self-dispensing strapping kits are all light, portable and easy to use. 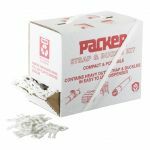 The handy strapping starter kits, which come with plastic buckles or metal seals, provide you with the essentials to perform general strapping applications, including sealing and bundling loads. 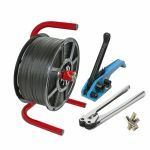 The complete starter strapping kit on the other hand features medium duty poly strapping, metal seals, tensioner and sealer to give you everything that you need to get your strapping tasks done. Our strapping kit with trolley, as well as the combination strapping kit with trolley, gives you the means to move generous amounts of medium duty plastic strapping while easily organising your strapping tools. 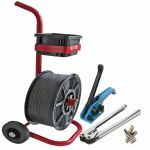 The medium duty strapping kit with dispenser is a safe way to dispense reels of poly strapping. Pallet strapping and bundling has never been easier than with one of our strapping kits.